To find tech specialists’ profiles in AmazingHiring you can make a search query or use the Talent Pools functionality. 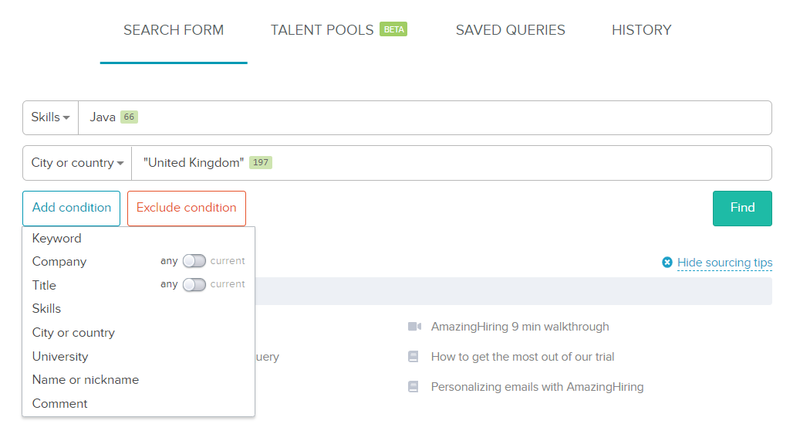 Read about the Talent Pools functionality here. You can also exclude the conditions. For example, if hiring specialists from some company is not allowed, you should exclude this company in the search query. The search query can be created both by adding different conditions and by including all the variables in the search field using boolean operators. Once you have entered a new variable, AmazingHiring will automatically suggest using one of the five logical operators.